Hello, here are the items I have been lusting after this week! 1. Mary Jane Heel Less Platforms - These are beautiful! I can't decide whether I want them in pink or black!! They are also super cheap and I want them so badly!! 2. 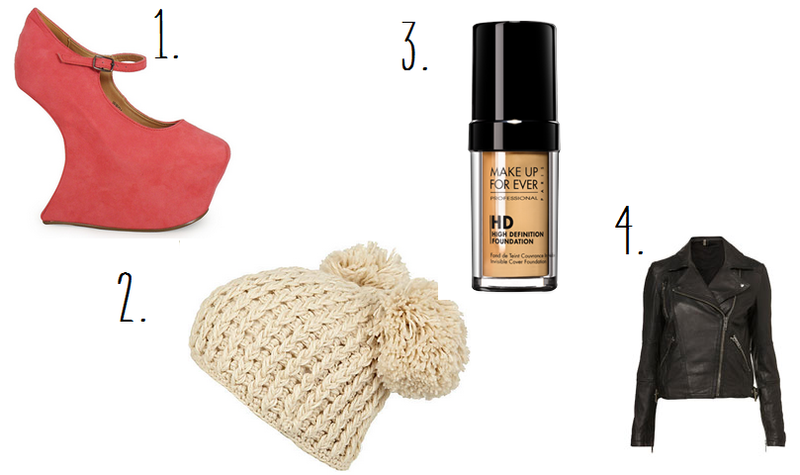 River Island Beanie - I have no clue why but I decided I wanted a beanie for Autumn/Winter! I LOVE a/w fashion a lot more than s/s so always have a ton of ideas for outfits! 3. Makeup Forever HD Foundation - I have wanted this for ages, at the moment I am loving Mac Face and Body Foundation but have heard such good things about it! Have any of you tried it? What did you think? 4. Topshop Leather Jacket - I used to not be a huge fan of leather jackets but recently I have really wanted one! Especially for a/w I think it could look really cute! I am sorry if I have been a bit absent recently and not being replying to comments, I didn't want to leave my blog while I am on holiday so am still posting but haven't had the time to reply to comments like usual! I'm going home on Saturday so hopefully I will be back to normal then! Even though I did a few rambly talky posts last week I feel like I want to do another! Do you guys like more personal posts or do you just follow for beauty/fashion? Although I need to start doing more OOTD posts!! It's currently 2:43 in the morning and I can't sleep so I'm writing this blog post while writing a "story" of sorts. I have always loved writing but thought I was pretty awful as if you ask me what a verb or adjective is I have no clue! But I am writing a sort of "FanFic" have you heard of those? You basically take characters from a tv show/movie/book and write your own scenario! It's fun, I may link it when I'm done, although it's rather racy (oooer) so not sure if I will due to cringe factor! Hahaha! i have used MUFE's hd foundation, and truthfully i didn't think it was worth all the hype! but then again, i shade matched myself in a hurry, and the shade i was using was way too dark for my skin. ha ha ha, oops! i'm thinking about trying it out again, though! I'm hunting for a leather jacket too. Miss Selfridge do a brilliant one, similar to the Topshop one, check it out! Enjoy the last couple of days of your hols!